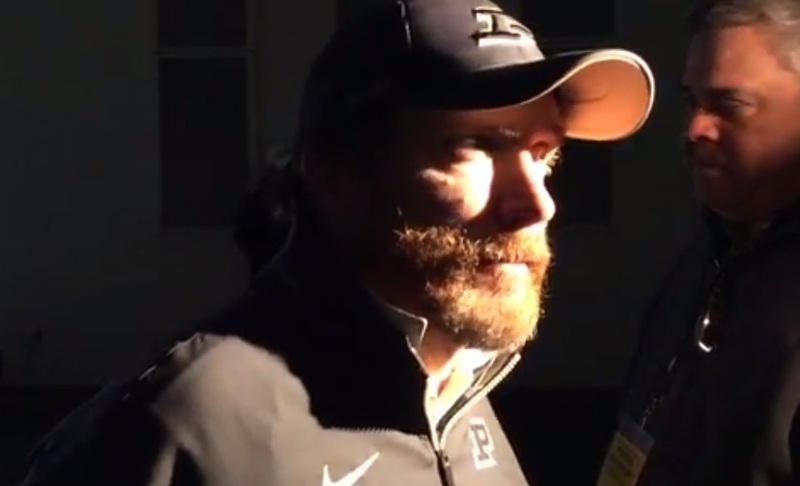 Looking like a hobo, John Shoop talked after practice on Tuesday. Well, yes, that is true. You have to play hard every week, coach. Every, single week. Your team needs to play harder, better and smarter than their opposition. You know what happens when you don’t? You get your brains beat in on your home field by a very beatable, hobbled, one-dimensional Minnesota team. Coach Hazell spoke to the media as well both in an official press conference yesterday and then from the field after practice today. So by their own coach’s admission, his team doesn’t block or tackle well enough to win. That’s encouraging. They’ve skinnied down the playbook so as to be more efficient. I don’t know whether to be optimistic about that or not. Now, I’m no football coach, but this doesn’t totally make sense to me. But hey, I’m sure it’ll all be clear on Saturday! Isn’t this always the case? And isn’t this something his teams have yet to do at Purdue? Hazell also talked about “technique and execution” a lot. So it leads me to ask… what happens when the guys aren’t executing? Do you consider benching them? Running harder practices? Nothing? He also talked to the leadership council and about how the guys confirmed that the first drive after halftime can do a lot to your level of energy if you’re not executing. So they’re perhaps putting all their eggs into one basket after halftime? Huh, weird. Wonder where they got that approach. Now, I don’t know about you, but I’m beginning to see some distress on the normally stoic coach’s face. I don’t suspect Coach Hazell is a guy you see a lot of emotion change from, but what I’m seeing is the look of a man who is also running out of answers. And he’s in the role where you always need to have the next answer. Where does Purdue go from here? Well, it’s hard to imagine things getting better at Madison, so buckle up.